Ken Armstrong Writing Stuff: How Green is Your Grass? Imagine if the grass you see is different to the grass that I see and, indeed, different to the grass that everyone else in the entire world sees. Imagine if we all see grass differently. Imagine if we all see absolutely everything differently. You see grass. I see grass. We both know that grass is green… but what constitutes ‘green’? Is the ‘green’ that I see the same ‘green’ that you see and how could we possibly know that it is? Imagine that this was true of everything in the world. That my apprehension of something is hugely different to everybody else’s apprehension of it and that I never-once even dreamed this was the case. What a strange and terribly lonely world that might be. Wake up, Ken, it is. The grass that I see is different to the grass that you see and so are the cars and the sky and the buildings and the carrots and the roof-slates and the toilet rolls. What I see is not what you, or anybody else, sees. It’s mine. If you don’t believe me, if you think I’m just typing out fantastical rubbish here, then stop for a minute and think. The Movies, as is often the case, will bring us to the truth of things. You watch a movie and I watch a movie. It’s the same movie in every single respect, let’s say we’re even in the same room when we watch it. Everything is the same. Except I love it and you hate it. It’s the same movie but we see it differently. We react to it differently. It shows itself to us in different ways. So it is with the grass and with everything else too. We inform the things we see with our own being. 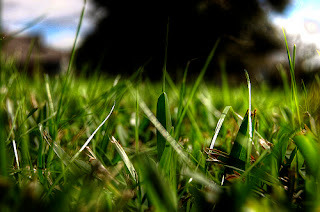 Things like grass. We do it with our memories (grass made my arse damp once), the peculiarities of our senses (grass smells like that stuff Mum used to rub on my chest when I was small and wheezy), our physical foibles (grass makes me sneeze) and our prejudices (grass is just stupid). In this way I can hate grass while you can love it, even though it's the same grass. We are, each and every one of us, imprisoned in an individual sensual and emotional world of our own making, unable to truly share any experience with anybody else. How awful and lonely and sad. We can learn, can’t we? About other people’s perceptions of things. We can hear what they feel about stuff and this can then colour and even change how we feel about that stuff too. It’s easier to talk about the Movies in this context than grass but it applies equally to both. I hated the movie, you loved it. Fair enough. I’ll listen to why you loved it. If you’ll tell me, that is. Maybe I’ll hear about some good stuff I overlooked in the movie while I was so transfixed with hating it. Maybe my locked-up individual view of this godforsaken world will be made a little bit brighter and more positive if I can only hear what you have to say about it and try to understand a little bit of what you feel about it. This is something that has fascinated me for years now. How is it possible to communicate with anyone when no one knows what you’re on about? I don’t usually talk about grass. I use love as my example. If there was ever a word that’s been overworked it’s love. We have to love our wives, our children, our friends, ourselves, our country, humanity, strawberry yoghurts, Nature, our pets and a million other things with that one tiny little word and yet when I say to someone, “I love you,” I still expect them to know exactly how the love I feel for them is formulated. I love you. Of course blokes don’t generally go round saying that stuff to each other but it doesn’t stop it being true. You know I like you—it’s okay for blokes to like each other—but what it ‘like’ but a safe way of saying ‘love’? I remember saying to my first wife when we were dating, “I’m in like with you,” because I wasn’t quite ready to lay the love word of her. Stupid really. Of course the you I like/love is an imaginary person. I don’t really know you so who I like/love may be nothing like the real you. Maybe we wouldn’t get on in real life. I’m not desperate to put that to the test but you see where I’m coming from. I’ve cobbled together a picture in my head of who Ken Armstrong is. I could be way off. I only really think of you a Ken-the-blogger/writer. The fact that you’re Ken-the-father, Ken-the-husband, Ken-the-[insert close relative here], Ken-the-employee, Ken-the-bloke-who-wanders-round-with-a-brolly isn’t of much relevance to me. Where I to pop round for tea once a week then it might be. But I’m content with this subset-of-Ken. As I’m sure you are with the imaginary version you have of me. The grass is only as green as we imagine it to be. Your comments are such a treasure, Jim. Thank you. "We are, each and every one of imprisoned in an individual sensual and emotional world of our own making, unable to truly share any experience with anybody else. We can learn, can’t we? About other people’s perceptions of things. We can hear what they feel about stuff and this can then colour and even change how we feel about that stuff too." You probably know by now that I usually find a way to apply music to everything. I did when reading your post, especially the bits I've quoted. How one person can love Phil Collins' 'Another Day in Paradise' when I would happily put it on a bonfire (and cheer, laugh, celebrate, petition for a Bank Holiday...ok, I have to force myself to digress).But I can now also apply it illness. Someone else and I can have exactly the same condition, but the way we view it and deal with it is completely different. This is not only due to physical and sensory aspects, it's also due to how we mentally perceive it. We've debated this heavily into the early hours of the morning. How something that attacks your body does not attack someone else's in the same way, at the same time, why we do not all feel pain or discontent at exactly the same time. It's one condition invading thousands of people - why is it we are not synchronized? Applying the 'grass is green' theory to this, we should, shouldn't we? We all feel and perceive things differently. Imagine if we didn't? What a boring, bland magnolia world we would live in. We wouldn't learn, we wouldn't grow, we wouldn't heal. Thank you for writing this, it's a fascinating subject to ponder, especially when it's affiliated to something universal like the colour of grass. You've made my neurons work this evening. Much welcomed and very much appreciated. ddrey: Thanks for lovely comment. I hope your grass remains green and lush and well.